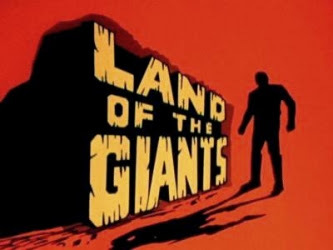 From the Archive: Land of the Giants (1968 - 1970): "Crash"
The final Irwin Allen sci-fi TV initiative of the 1960s, Land of the Giant (1968 - 1970) ran for two seasons and fifty-one hour-long episodes on ABC, and involved a group of desperate castaways trapped on a dangerous world of gigantic humanoids and other over-sized threats. The first episode of Land of the Giants, written by Anthony Wilson and directed by Irwin Allen, "Crash" commences on the far future date of June 12, 1983. A sub-orbital ship, The Spindrift, encounters "solar turbulence" upon final sub-orbital approach to London. Before long, the small vessel crashes on a strange world, and the crew and passengers encounter the peculiar dangers of this planet, namely giant spiders, cats, lizards...and (apparently) humans. The Spindrift crew contingent includes Gary Conway as Captain Steve Burton (Gary Conway), co-pilot Dan Erickson (Don Marshall), and Betty (Heather Young), the stewardess or flight attendant. 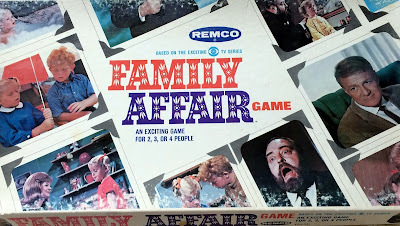 The passengers include the Dr. Smith-like trouble-maker, Alexander Fitzhugh (Kurt Kaszner), a young boy, Barry (Stefan Arngrim), the beautiful Valerie (Deanna Lund), and an impatient businessman, Mark Wilson (Don Matheson). 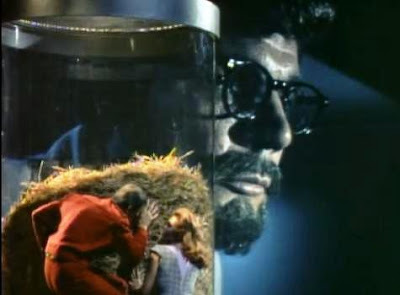 In "Crash," Steve and Valerie are captured while exploring the jungle surrounding the downed Spindrift and abducted to a laboratory inside a scientist's (Dan Watters) insect specimen container. The alien scientist -- a dead ringer for a young George Lucas -- discovers his unusual trophies, and straps the helpless captives to specimen slides, where he prods the helpless humans with scalpel and pencil. In short order, Dan and Mark engineer a rescue, exploding a gas line in the giant's laboratory as a distraction. Like much of Irwin Allen's work in cult television, Land of the Giants is long on production values and action, and short on inventive character development or social commentary. Here, in the premiere episode, the same existential threat repeats again and again. In "The Crash," our heroes are endangered by one gigantic creature after another, which leaves the women screaming in terror. Despite the relative emptiness of the narrative in terms of stock characters and villains, "Crash" remains quite an accomplishment in terms of special effects and production design. The mist-enshrouded jungle studio set, for example, is colossal, and more-than-convincing for its day. Additionally, it's important to recall that Land of the Giants was crafted well before the age of CGI and digital effects, so the over-sized sets and props all had to be constructed, and then meticulously matched with "regular"-sized live-action footage. By and large, the special effects haven't aged very much at all, and are still incredibly effective. This is as it should be: each episode of Land of the Giants was budgeted at a then-whopping $250,000 dollars. Sometimes, the strong effects actually do create high drama.Good tension arises in "Crash," for instance, when the George Lucas lookalike giant pursues the escaping Earthers to a small gutter, and then stretches his arm into the tunnel after them, shouting "come back." The scene represents a dazzling and effective blend of viewpoints and effect techniques. In terms of the continuing series, "Crash" also sets the tenor for Land of the Giants. Here, Steve and Valerie quickly debate about whether or not they should attempt peaceful communication with the planet's giants. Valerie wants to try, but Steve insists they will merely be treated as "six inch tall" freaks. Very rapidly, it is Steve's view of things that legitimized by the events of the episode, since even a scientist is not inclined to treat the tiny people very well. By episode's end, the castaways from the Spindrift, including Barry's dog, Chipper, end up at "the bottom of the barrel," a garbage dump, and encounter a vicious dog there. Already the die is cast: this is a world of danger, and the giants are to be treated as enemies. Over the course of two years, Land of the Giants presented much information (some of it contradictory, if memory serves) about the planet of the Giants. The Giants, for instance, had an awareness of Earth's existence and were also conscious that transit between the two worlds was possible. 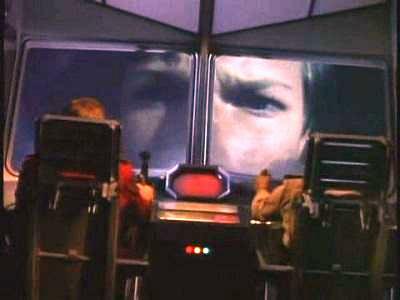 Yet, at the same time, the giants did not seem to be as technologically-advanced as Earth of 1983. Various episodes of the series saw the castaways either attempting to repair their ship and leave the dangerous planet, or effect change on the planet itself, which seemed to be ruled by a repressive totalitarian state. I grew up watching Allen's Voyage to the Bottom of the Sea and Lost in Space, but not The Time Tunnel or Land of the Giants. Accordingly, I find the latter two programs a bit difficult to "get into" today, and even a bit empty in terms of ideas, characters and situations. In short, I admire how Land of the Giants looks in terms of design and execution, but that isn't enough to keep me tuned in for the full fifty-one hours. Rather, I see Land of the Giants as intriguing because it fits entirely Allen's basic formula in science fiction television: showcasing, essentially, how technology can go wrong, stranding people in time, outer space, or other hostile environmental domains. In at least three of Allen's programs -- excluding Voyage -- the technologically-superior people end up forsaking the advanced tools of technology to "live off the land," more or less, and embrace a more primitive, pioneer life-style. I suspect Allen's TV work looks this way, in part, because of the popularity of the Western genre on television in the 1960s. But also, as you can detect in many Star Trek episodes of the day ("The Ultimate Computer," for instance), there existed a general distrust of technological progress in the late 1960s, mainly in the form of computers and automation. I submit that Lost in Space, Time Tunnel and Land of the Giants all key off both the rampant techno-phobia of the decade while also hoping, contrarily, to tap the "Camelot"-styled optimism of the age as well. These two opposing impulses make Allen's series somewhat schizophrenic, but also damned interesting, at least in terms of analysis, or interpretation. If ever a show deserved a third season it was "Land of the Giants". Funny I just happened to watch this at Hula a couple of weeks ago and my reaction was similar. 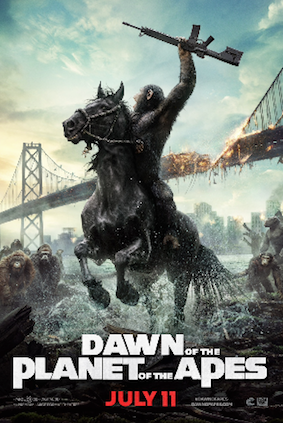 The special effects and production design are stunning and some the action sequences are very well directed. But what a lazy job of character creation. The Doctor Smith/Will clones are beyond tepid. But I have to admit I keep watching it because of Deanna Lund and the art direction. A good guilty pleasure. Lol yes the George Lucas villain is awesome! Actually an effective and creepy character!